When’s the last time you went to a concert that kept you captivated for a solid week? Well, for the last week, I’ve been buzzing from a show I went to last weekend. Before I go into the details, I would first like to thank my friend Sgt. Tibs at Chicago Now blog GoWhereHipHop for having a great Common and The Roots Trivia contest. You should check out the blog for more fresh hip hop music and other cool contests. I’m thankful for being the fan who ended up winning the two tickets because it gave me the chance to visit The Shrine, a club in the south Loop in Chicago that I’ve been wanting to checkout for awhile. The Shrine show was sponsored by Hennessy and co-curated by Common and the Roots. And it turned out to be one of the best shows I’ve been to thus far in 2009. No need to call on F.A.N.S. for this show. And now I’d like to share with you why I left The Shrine feeling so pumped, excited, hopeful and reassured about the galvanizing and unifying power of live hip hop. The show had so many peaks that I can’t go through and breakdown all of them. But, in the videos below, I’ll share some of my favorite highlights. The moments I captured respresent what I feel makes live hip hop so much fun and life changing. These videos also capture two artists (Common and the Roots) who both know how to unify the masses and give their fans a reason to put their hands up in the air. Because sometimes hip hop artists command fans to get loud or raise their hands without earning it. But with the Roots and Common they earned it right from the start and I didn’t have to think twice about throwing my hands up. I just had to figure out a way to keep the camera steady because the feeling and energy was instantaneous the minute they took the stage. And the Roots and Common are both pros and making their fans feel as one. That said, I want to tell you that this concert left me feeling strongly connected to my fellow hip hop fans. It truly felt like a community. It saddens me to say this, but it’s been awhile since I left a show feeling so unified with fellow fans regardless of skin color, social status or race. Hip hop doesn’t always succeed at unifying its fans–which largely depends on the artist’s m.o. But I left The Shrine feeling encouraged and reassured at hip hop’s power to eliminate and completely disregard the color barrier. From ?uestlove’s first snare pop to the last fan yelp of admiration, Common and the Roots made the whole show all about the music and the moment. And they squeezed every once out of the universal and inherent power of hip hop to unify its fans. As we entered The Shrine the buzz of anticipation hit us. I smiled at my wife as we made our way onto the main floor. The club was packed. I was bumping up against other fans, our bodies rubbing up against others. But I didn’t mind it because it wasn’t the annoying kind of bumping and rubbing. It was the kind that communicated intimacy and fellowship. It was the kind of feeling that let me know that an event was about to happen. The atmosphere was real, personal and authentic. I didn’t have these specific feelings before the show, but when we entered The Shrine I had a growing since that this concert might end up being eternal in some way. And it did. The Roots strolled on stage and dove into the first song. It was as if emcee Black Thought and The Roots reached into all our hearts and minds simultaneously and knit us even closer together. The video below drops you right into the middle of their set. What you’ll see is a peek at Black Thought’s masterful rhyming and tuba man Tuba Gooding, Jr.’s hilarious grooving as he dances across the stage, which stretched across the bar below him. I hope you can get an idea of what I felt, or at least remember moments like this when you’ve been to a show where a band is so on and so tight that you just get caught up in the electricity of the moment. You can see my excitement because I had a hard time staying still enough to keep my hand steady to film. I’ve seen The Roots many times before and this was one of their best shows I’ve ever seen. The groove grabbed me good and didn’t let go! Then came hometown emcee Common. He charged into a shortened and more volcanic version of “The People,” and then took the crowd through an emotionally moving tribute to the late producer J Dilla. From the crowd sing-a-long to the freestyle that followed, there was so much soul flowing through The Shrine during Common’s set. Then came a freestyle. Common amped the crowd’s intensity even more. Watching Common’s freestyle reminded me of how a jazz player would prep on the fly before jumping into an improvised solo. 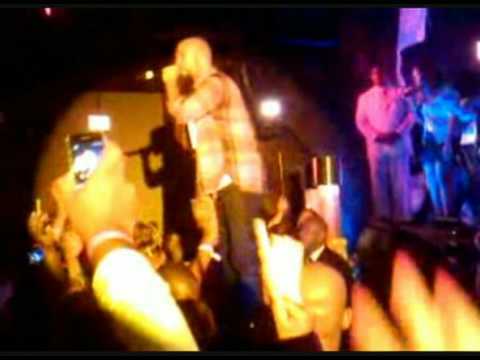 In the video below, I love how Common simultaneously maintained the crowd’s intensity, by covering the citywide compass with shout-outs to all the Chi-town “hoods,” and readied himself for a forthcoming lights out freestyle. In perfect time, he flew through his righteous freestyle and capped it off with a dynamite Obama-centric punchline. It was all tight rhymes and intoxicating flow. Old school stalwart rapper Heavy D also showed up and played some classic hits and some new reggae tracks. And it was during his performance of the classic “The Overweight Lovers in the House” that a fan, who I didn’t know before this show, looked at me and grinned the biggest grin and tossed me a fist bump. That knunkle-to-knuckle moment ranks as one of the most memorable of my recent concert experiences because it was more than just two fans sharing a great live music moment. It was a micro-moment that personified the vibe in The Shrine. And to me it was a black fan and white fan sharing a golden moment that was so pure and so honest and transcendent for both of us. I also think that moment was important because I know that there’s still a huge struggle with race in our country. And, unfortunately, hip hop isn’t immune to racism. As a white male, I’ve been to hip hop shows where I didn’t feel welcomed because of the color of my skin, or I didn’t feel any sense of fan solidarity, unity, energy or community among the fans before, during, or after the show. Disappointing, disconnected and disinfranchised hip hop shows confirm for me that live hip hop still has a long way to go to break free from its self-destructive chains and skin-colored shackling stereotypes. But this Shrine show was the polar opposite. It inspired me. It gave me hope. And when that black fan extended his fist bump to me and I connected with him, it was a moment I will never forget. It was a moment that I know Afrika Bambaattaa, Grandmaster Flash and Kool Herc would smile upon. And I know it’s a moment that Common and the Roots were intent on creating well before the show started. I can’t say it enough so I’ll say it again. I felt so connected to my fellow fans. It was as if we were all one! Hey, if you were at the show, how did you feel? Have you ever been at a show (hip hop, rock, etc.) were you felt like I did at The Shrine? You're Invited to a Live Fix Experiment!